I was in Ithaca, New York last weekend for my father’s birthday. He’s a rather active 80-year-old as of the weekend, and you may recall his help in building a new top bar hive this past winter. My siblings and I were there for a couple days to celebrate the milestone and enjoy each other’s company. Of course, a couple beekeeping activities found their way into my travels as well. The drive from my house is roughly six hours, and travels through central Pennsylvania on Route 15. 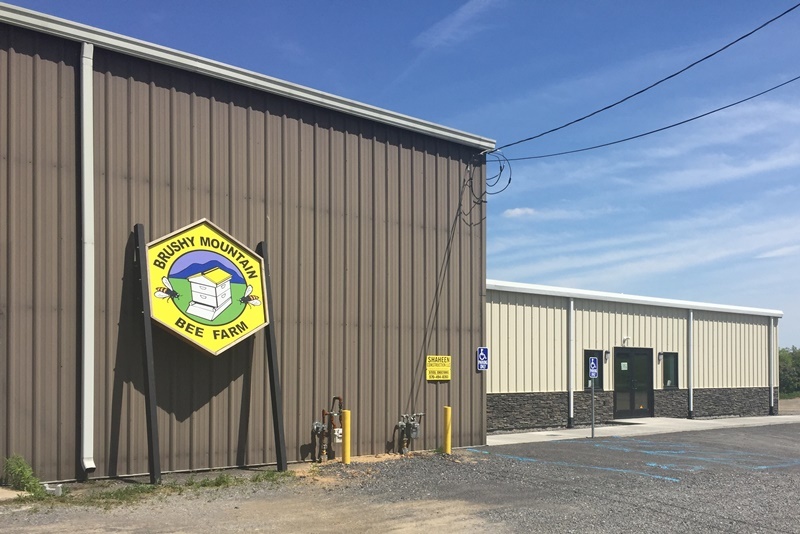 Brushy Mountain Bee Farm has a store right along Route 15 in New Columbia, PA. I stopped in and picked up some assembled frames, wax foundation, and a capping scratcher. I am rather tired of manually assembling frames, so it is nice to have frames ready to go. 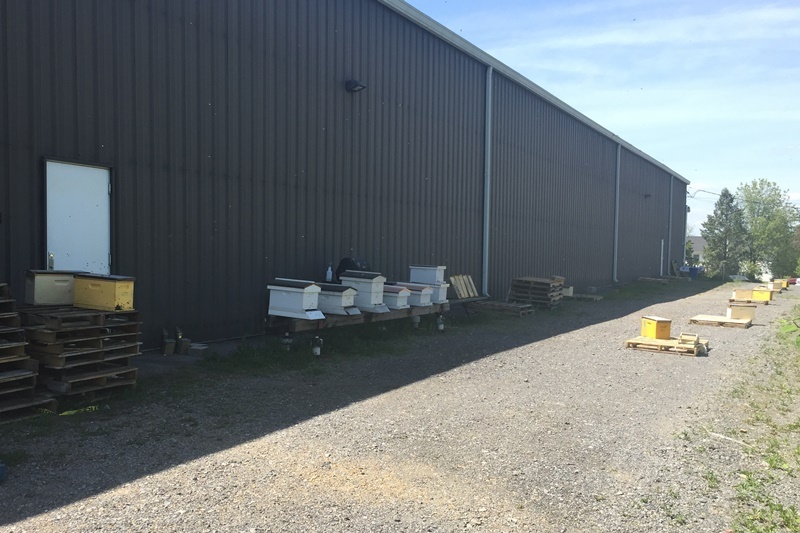 The store is mostly a warehouse, with a display area full of bee supplies. There was a Queen Castle that was quite interesting, and other things I probably shouldn’t bee buying right now. I picked up my purchases in the back, not too far from the many hives behind the building. If you are ever in Ithaca on a spring or summer weekend, take a visit to the local Market. It is open Saturday and Sunday and offers a variety of vendors offering food, plants, soap, photography, woodworking, and more. It’s a pretty amazing experience and probably the best market around. For proof, how else would a small town like Ithaca, NY make the top 20 list of best farmers markets in the world on TripAdvisor.com. While you are visiting, you may find Beekeeper Duane Waid there, selling the local honey he has produced for over 40 years. My father sells his woodworking at the market, so I had met Duane before. I really enjoyed talking with him about bees and hives. If I head up to Ithaca later this summer I may bring my bee suit and try to visit his hives. 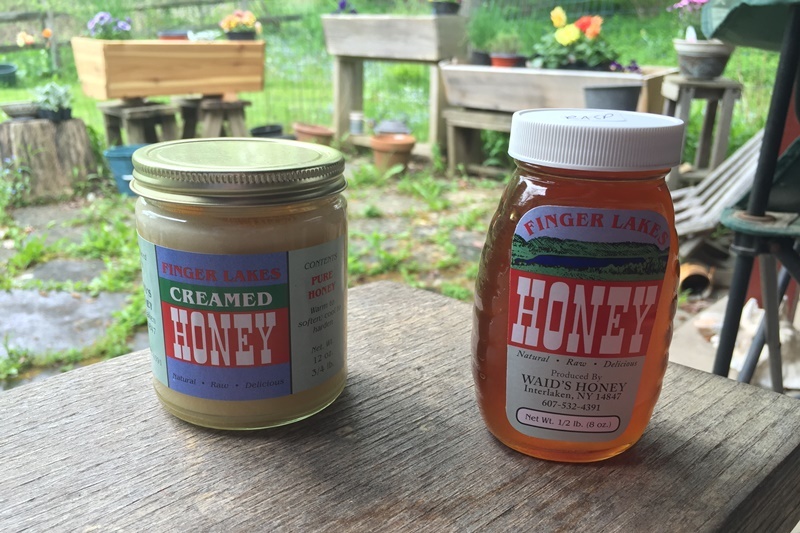 I couldn’t resist buying some of his raspberry honey, along with my daughter’s favorite: creamed honey. Of course, the main point of the visit was my father’s birthday and visiting with my siblings. We laughed, we ate, we worked on a puzzle, we walked in the park, and had a nice family weekend. The simple joys of life. This song by Billy Joel seemed an appropriate basis for a post about my trip to New York. I visited the state, not the city described by the song. Oh well. The fact that I picked up some hive frames along the way made for a simple title adjustment. I actually saw Billy Joel in concert once, in Pittsburgh, PA, though I don’t recall if he sang this song or not. Happy birthday to your dad! Sounds like a great trip. The Finger Lakes region is so beautiful, and it must be nice to have such an excellent reason to go there often! Wow! Had no idea the Brushy Mountain store was so huge! That looks like a trip-worthy destination on its own. Thanks, Jule, it was a great trip! Ithaca is a great town, if you don’t mind the cold and snow. The Brushy store is actually not that big. The building is a fairly large warehouse, with the store taking up a single room at the front. Almost a little disappointing in how mundane it is. I had meant to buy a queen excluded, as I don’t have one yet. Next trip.